The largely homogenous nature of Tettnanger hops is defined by the optimum interplay of geographical factors such as the soil type and climate during the period of growth and cone formation. Tettnang hops are cultivated exclusively on what is known as lower terrace gravel (the young drift landscape from the Würm glaciation period). Lake Constance, Germany’s only large lake in the Alpine foothills, has a temperature correcting effect – it serves as a heat store in winter and has a cooling effect on the microclimate in summer. In its dormant period, during the winter, the hop plant is frost hardy. Growers hope for dry, warm weather for the spring work period. When the side shoots are forming, the plants need warmer weather and this requirement is greatest when the cones are forming. An average temperature of 8–9 °C across the year and 1,800 to 1,900 hours of sunshine per year are optimal. The graphic shows the average temperatures distributed across the months of a year for the Tettnang area over a 30-year period. Sufficient and well-distributed precipitation is required for good yields. An average precipitation of approx. 1,000 mm/year, as is generally the case in the Tettnang growing region, is sufficient, whereby there is a distinct summer maximum. As a rule, cooler, wet summers bring higher yields with better aroma and bitterness values than hot, dry summers. The graphic shows the average precipitation distributed across the months of a year for the Tettnang area over a 30-year period. 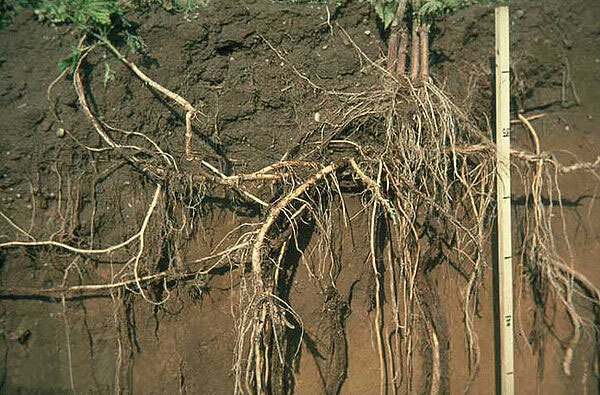 To be suitable for growing hops, soil should be deep, capable of root penetration to approx. two meters, and have a steady water supply. Hops are cultivated on heavy clay soils and light sandy soils. The heaviest clay and pure sand however are unsuitable due to their poor water retention qualities. Since these days work management and technical aids are more important than the absolute characteristics of the soil, loamy sand and sandy loam can both provide good results with the appropriate addition of organic substances.